PALU, Indonesia (AP) — She lay inside a medical tent in the stifling midday heat, wincing in pain at the gashes and cuts that cover her body. But all Anisa Cornelia could think about was the love of her life — the man she was supposed to marry this month. She had not seen him since the tsunami smashed into an Indonesian island, separating the pair possibly forever as they strolled along a sandy beach at twilight. “Where is my fiancé? 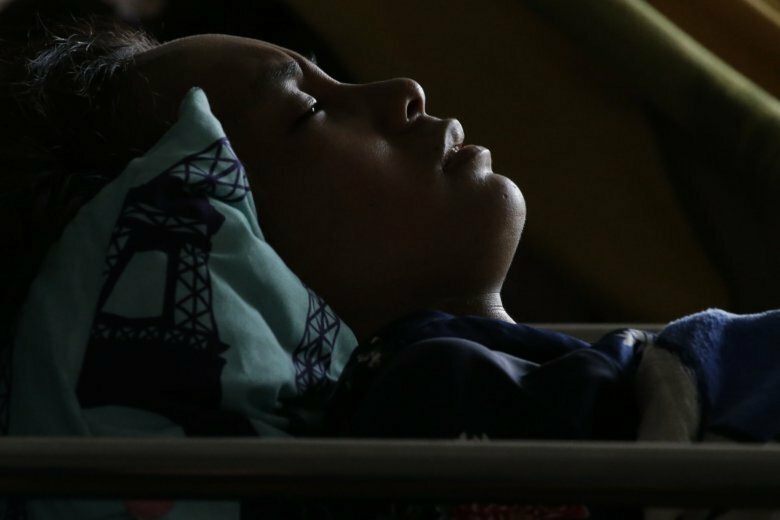 Please, do you have any news?” the badly bruised 22-year-old pleaded as medical staff came to check on her in the courtyard of the main hospital in the city of Palu. One week after the magnitude 7.5 earthquake and tsunami, countless people have yet to find their loved ones — both survivors and the dead. As of late Thursday, the government counted 1,558 dead, with 113 people missing and another 152 believed buried in mud and debris and not yet recovered. Many families, though, never registered their losses with police. It’s also unknown how many might have drowned, been swept out to sea or were swallowed up in two Palu neighborhoods where the ground liquefied as the quake’s shaking condensed loose, wet soil into mud. Lisda Cancer, who heads the local police’s Department of Victim Identification, said about 600 of the bodies buried in mass graves in Palu alone were unclaimed. Until Wednesday, authorities had been photographing them in hopes that relatives could identify them later. The disaster has overwhelmed local authorities. On Thursday, a private ambulance brought the corpse of one man who had been found in the road to two hospitals, including the one where Cornelia was being treated. Both facilities turned them away. Before the vehicle drove away, a woman in a red headscarf who had been searching for her missing daughter for a week began weeping. Hospital staff said they had received her body, but had released it for burial already in one of Palu’s mass graves. Cornelia said she met her fiancé, 25-year-old Iqbal Nurdiansyah, seven years earlier through friends at school. She was attracted to his warm personality, his bushy eyebrows and his handsome face. Three years ago, he took her to her favorite restaurant, on Palu Bay, and proposed. A two-week wedding ceremony was set to begin Oct. 15, culminating in a reception at a hotel called the Swiss Bell, which also overlooked the beach. On Sept. 28, the couple was walking along the sandy shore after an early dinner with eight members of Nurdiansyah’s family. Nurdiansyah remarked how beautiful the sunset was, and he organized a group photo. Then, suddenly, the ground shook under their feet. As terrifying as the tremor was, Cornelia and her husband-to-be thought they had escaped the disaster unharmed. Shortly afterward, though, she heard a roar and turned to see a huge wave rushing toward them — the largest she had ever seen in her life. All of them began to run. The last time she saw Nurdiansyah, he was trying to scoop up two of his young nieces to save them. Miraculously, she was still somewhere on the beach, largely unscathed and able to stand up. But then a second wave struck, this one lower and much faster. The wall of water dragged her at least a kilometer (mile) inland, shredding her entire body — head to toe — among smashed blocks of concrete, broken wooden planks and swirling garbage. When the water finally began to retreat, she found herself alone — pinned between a metal fence and the stage of a soccer field. A man helped her up and she limped in the darkness, past smashed cars that had been thrown onto piles of debris and a naked man whose clothes had been ripped off by the waves. Of the nine others who had been on the beach with her that day, only one is known to have survived — a 5-year-old niece of Nurdiansyah. Two others have been confirmed dead, while six are still missing. At the hospital Thursday, Cornelia’s 44-year-old mother, Ray Djangaritu, tried to console her. Friends had searched hospitals without luck, but maybe he was taken to another city as other wounded survivors had been, she said. Cellphone networks have been down or limited for much of the week, making it hard to communicate. “I believe he’s still alive,” she said. Tears seeping from her eyes, Cornelia held onto that hope.